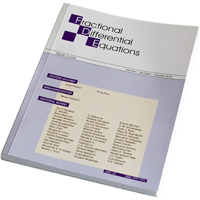 'Fractional Differential Calculus' ('FDC') aims to publish original research papers on fractional differential and integral calculus, fractional differential equations and related topics. Specifically, contributions on both the mathematical and the numerical analysis of fractional differential calculus in engineering and sciences are welcome. Only papers of the highest quality will be accepted for publication. 'FDC' is published semianually, in June and December. Abbreviations: FDC, Fractional Differ. Calc.